Today was packed to the brim with activities. After a full day yesterday of flying and the night safari. We went to bed at 11:30 ish at night, but Adelaide time.. That is approx 2:00am so we were knackered. We woke up at 6:30 to go down and have breakfast at 7:00. Something that we're not doing tomorrow. Haha breakfast can be at 8:00! But on the topic of breakfast. Oh my lord. It was beautiful. It was a full buffet breakfast, the price was included in our room fee so that was something we didn't even have to think about. The breakfast restaurant was beautiful and Kris and I were seated at a window view (we later moved to have breakfast with everyone once we noticed they were there too). Breakfast is on level two. We catch the elevator down from our rooms. 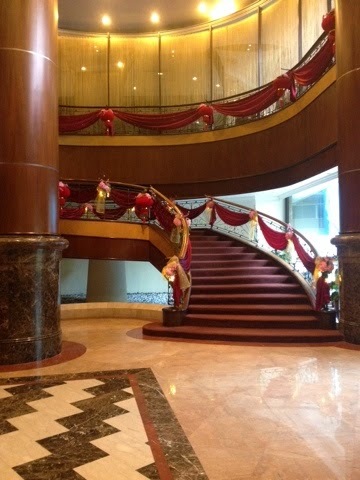 But from the ground floor you take this beautiful staircase up. It reminds me of beauty and the beast. Just imagine Belle coming down the stairs in her beautiful yellow gown. We filled up on breakfast. I had a very multicultural dish, because there was just so much on offer. They had some steamed dumplings etc which I didn't go for but Kris did and he liked them. I had some steamed noodle salad, a hash brown some scrambled eggs and I thought "Yep, this is awesome, doesn't get much better than this". Then I saw some fried rice so I had a spoon of that. I got my glass and sat down. When going up to get my juice I noticed they had an Indian section. (Died and gone to heaven) I had a scoop of chicken curry. (All scoops were half the size of my palm). So I had a multicultural tasting platter. I was so happy. When I went to get toast. I noticed an entire section dedicated to different breads. I came back with a croissant and the intentions for a pain au chocolat. I finally got my fruit juice and set out to conquer my plate. Today was Lindsay's birthday. Which is basically the reason we're on this holiday. So it was his choice of activities for the day. There were a few things that everyone wanted to do and so we all decided that today we'd do the gardens and tomorrow the aquarium. We finished breakfast and then went back to our rooms to get ready for the day. 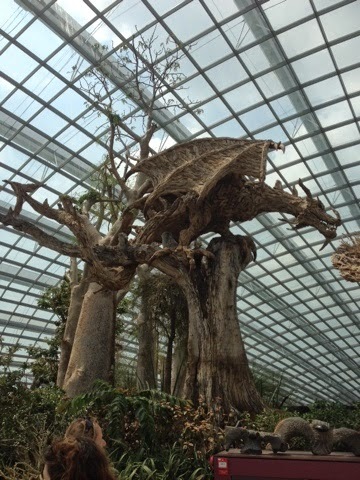 Destination: Gardens by the bay. We arrived after a short taxi ride and the driver was really nice. So that put me in a good mood haha. We walked around and decided to do both of the domes. 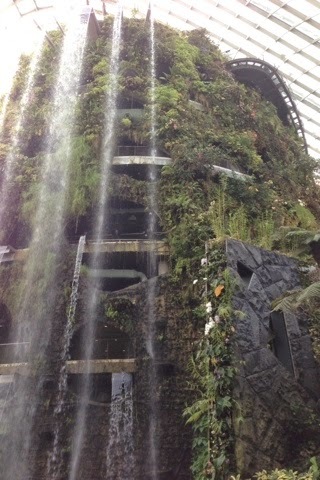 We started of with the 'Cloud Forest' and make sure you watch the vlog later on because I filmed most of it. We walked through the doors to a dramatic temp change (for the better; trust me) and a huge waterfall covered in tropical plants with a path the spiraled up around the 'mountain'. As we climbed up and around the structure, the mist being sprayed on the plants made it look like fog. 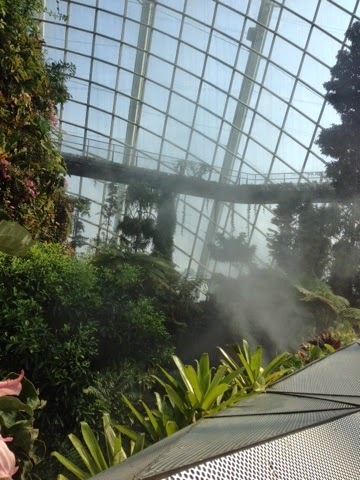 Hence cloud forest. I won't spam you with pictures of flowers but I'll share a few. This is the mist that makes the 'clouds' it was so great. The railing you seen is how high the walk goes. You get a great view of the entire dome and at the top there is a really peaceful infinity pool garden. It was quite slippery at the top and while there was the main path, on either side there was more path but it was see through grates that made me a little uneasy when walking in them but then I realised I'm not scared of heights. So I was fine. Mum was a little sketchy though, but she did great. She's iffy with heights but still made it. Yay mumma. This is the peaceful pond on the top. It was so pretty. On our way down we stopped off at the other floors and saw some of the other 'exhibitions'. There was one dedicated crystals and cave structures etc. we spent a good hour and a half I think in the cloud forest area. We entered though a gift shop (as per the usual) and we had a look around but didn't really buy anything. Although I really want to buy a nice fan. I hope I can get one that I can bring through customs. Now it was time for an ice cream break! It was so refreshing because it was so hot outside but also so disgustingly humid. I've never felt so refreshed by ice cream, ever. 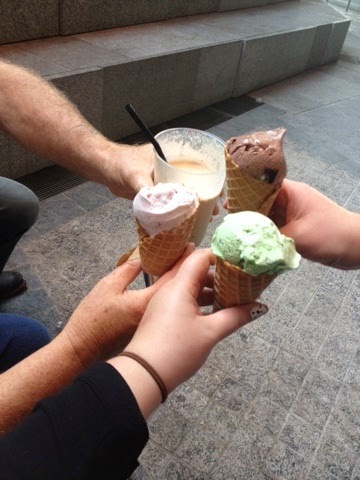 I had choc mint, Kris had Belgium chocolate, mum had mixed berry and Lindsay had a coffee thick shake thing. 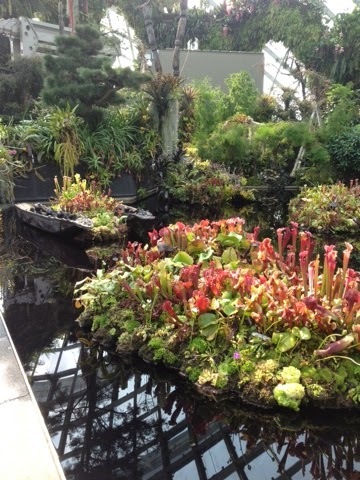 After the delicious ice cream it was time for the 'flower dome' this place was incredible. 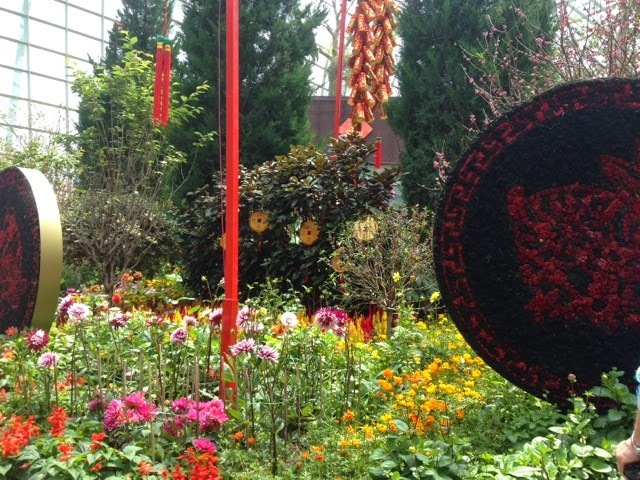 They had themed gardens from around the world with native plants to those areas. There were driftwood statues of the Chinese zodiac including a majestic dragon and more varieties of flowers than I've ever seen in one place before. This is the dragon. Just check out the size of it. It's amazing. When we first walk in to the dome, we're ushered to our right. I didn't really understand why until I reached the point with the dragon. To the right was just a small section (and by small it was still pretty big) of baobab trees and succulents in a gazillion varieties. It isn't until you reach the high point lookout area where the dragon is, do you see the sheer size of the dome and how many levels there are to explore. When going through the rest of the place and all the themed gardens, we found the Australian section. The first plant was a massive bottle brush tree and I felt right at home. They had some pretty unique plants. Some from other states of Australia so that was actually kinda cool. We wandered around aimlessly just taking in all the colour. 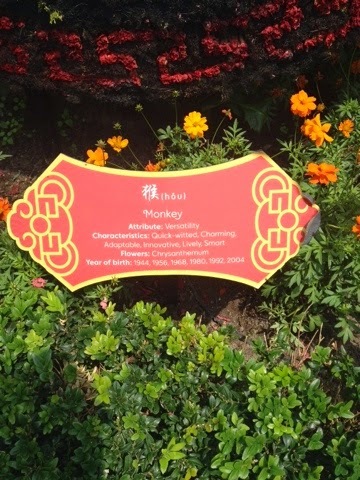 They have a huge section dedicated to the Chinese zodiac and it was one of my favourite places. There was a huge disk with what animal it was with a plaque underneath giving facts about that zodiac sign. Kris is year of the horse, I'm year of the monkey and mum is year of the dog. I could have easily spent all day there. But we had to get moving. 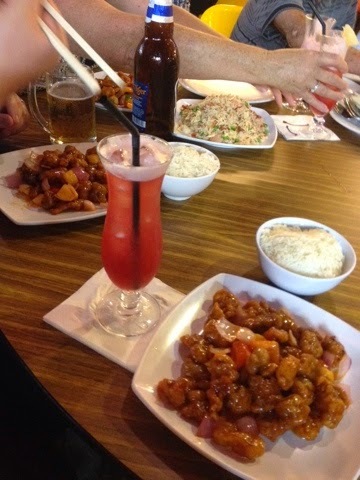 We were going to go to china town and get some lunch then retire back to the hotel until dinner, but we decided to go to the 'Singapore Flyer' instead. Basically the London eye of Singapore. I didn't really care much for it but went along anyway. We were going to take a taxi, but couldn't get one. So we decided to walk. Bad idea. We ended up walking along side the freeway on a small pedestrian strip. We had to 'off road' it by 'sliding' down a steep hill where in which I rolled my ankle and my mood was instantly annoyed. Anyway there were some awesome views on the way. That big wheel in the distance; that's where we walked. It was ok. I was just annoyed because I didn't want to go up in big wheel thing and I thought we were taking a quick trip there then we'd take a quick trip back. But oh well we're all good now. Kris and I got a cab back. My ankle is sore and I hope it'll be better tomorrow. I'll just take it easy. 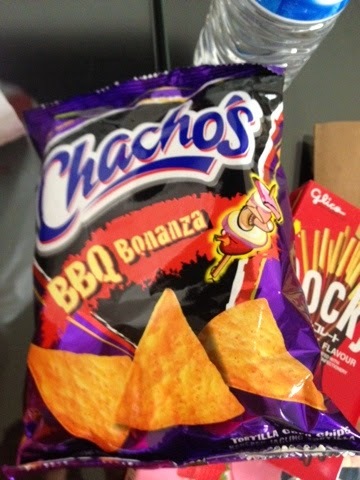 Kris came back into the room and said: "Why have Doritos when you can have chachos!" They were actually pretty good. He also got some 'Mi Goreng' but halfway back to the hotel he realised we don't have a microwave. Upon discussion of this we realised we have no forks or bowls either. 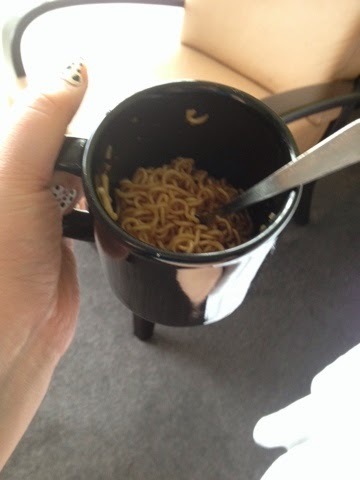 So, we made it in the coffee cups in our room, we used the tray the cups were on as a lid, boiled the kettle and did this thing old school - cup-o-noodle style. We ate them with tea spoons, and all is well with the world. Soon after that the others got back from the Singapore Flyer and we all kinda made arrangements for dinner then hung out. We were gonna go into China Town and see what was there. It was awesome. We caught a bus in then when we reached our destination (a few stops into the hustle and bustle) the streets were alive with activity and culture. We wandered around and I instantly got immersed in the street life. 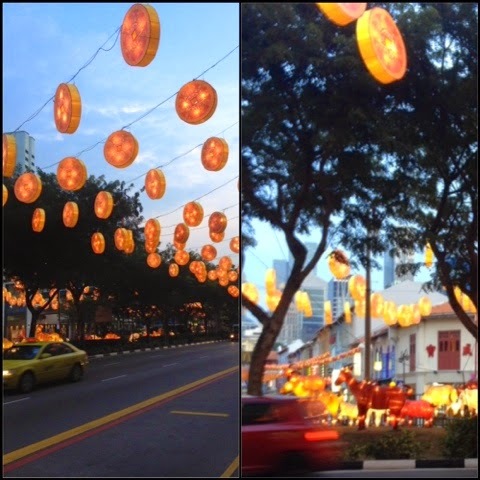 The streets were full of lanterns and coins because of the Chinese New Year. As it's year of the goat, there were so many statues and lanterns about; it was stunning. We crossed the road and walked down an ally full of stalls and restaurants we found a place to eat but as there were now ten of us, we thought it would be difficult. Nope. They actually rolled out a new table and placed it In the street, set it up with chairs and we were good to go. I had sweet and sour pork with steamed rice. Kris had the same. To drink I had a Singapore Sling cocktail and Kris had a giant bottle of beer, 633ml I think. Dinner was great but I couldn't finish it. We all wanted to do separate things after so we kinda spit up after food. Kris and I did a little shopping then walked around the streets of china town before hopping on a bus and walking back to the hotel. We had such a great night and I can't wait for island exploring tomorrow.